On July 19, 1936, the Spanish Revolution and Civil War began (Anarchism, Volume One, Chapter 23). 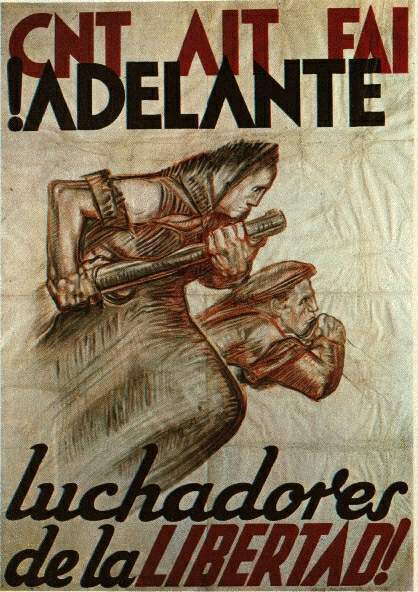 Anarchists in the anarcho-syndicalist trade union federation, the Confederacion Nacional del Trabajo (CNT), and the Iberian Anarchist Federation (FAI) were instrumental in preventing fascist military forces from taking over Spain in one fell swoop, organizing armed resistance and collectivizing the fields and factories in areas where they were able. This is a translation of a CNT-FAI pamphlet approved at the December 6, 1936 Regional Plenum of the FAI for distribution to Spanish peasants unfamiliar with the CNT-FAI, in order to assure them that the CNT-FAI was opposed to the forced collectivization of the land, but also to convince them of the benefits of libertarian communism.The translation is by Paul Sharkey. 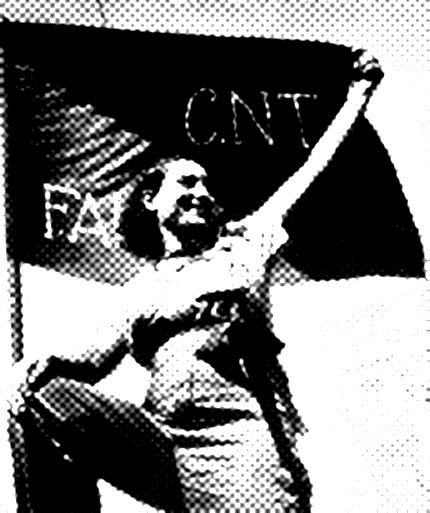 The National Confederation of Labour (CNT) and Iberian Anarchist Federation (FAI) address you. Both are made up of urban and rural workers, by workers and peasants who, like yourself, work for their poor fare and would like to live better. Of workers, and no one else. In our ranks you will not find folk who live off somebody else’s labours – property-owners, capitalists, rentiers or bourgeois who purloin the fruits of another man’s sweat. You and we, we and you like are members of the same family as all who produce all of the wherewithal of life and who have always, thus far, seen those who did nothing living a life of luxury and wallowing in everything while we lack life’s necessities. The time has come for this to end. Listen, comrade, to what we, the peasants and workers of the CNT and FAI have to say to you. Your parents, your grandparents, your forebears worked on the land and made it ready for cultivation. Can you still remember them, with hoe or pitchfork in their hands? You too labour as they did. And your children will labour, as you do. Who benefited from that toil by your forebears, your grandparents, your parents? Whom does yours profit? And tomorrow, who will benefit from your childrens’, unless things change? The boss, the landlord, the proprietor. The State and the whole bureaucracy that oppress us with their levies and taxes. The middle-man who traffics in the fruits of your labour. You hand over thirty or forty per cent of your crops to the landlord. You pay very heavy taxes to the tax-collector. The middle-man charges a hundred pesetas for what he bought from you at fifty. The fact is that right now, thanks to the revolution made by the CNT and the FAI, this has eased or stopped for a while. But that pause will be a fleeting one unless you make up your mind to join with us to ensure that the landowners, tax-collectors and middle-men cannot gain the upper hand again. When the wheat, rice, potato, orange, grape or any other harvest is good, instead of your benefiting from this, as ought to be the case, you are worse off, because, on the pretext of a glut, they pay you such a poor return that you get no reward and you are denied what you need to live. When the harvest is a poor one, you have little to sell and earn little. Everything backfires, everything works against you, the way things are organized. But the landlord carries on living the high life, the State gets its taxes and the middle-man carries on trading. Does this seem fair to you? Is it the truth or not? We of the CNT and FAI want to see these injustices ended. We want to prevent others from being masters of the land that you work. We want to stop others from living off your exertions by depriving you of twenty, thirty or forty per cent of your harvests. We want an end to a situation whereby there are the rich who do nothing alongside so many of the poor who labour. Let’s look at something familiar to you. Say there is a cold snap, or a drought and a crop is destroyed. As you well know, this is a frequent occurrence. The peasants hit by it are left penniless and facing a year of wretchedness, hunger or scarcity. Is that reasonable? Is the fault theirs? Is it your fault if the rain stops falling, if there is an unexpected cold snap, killing the buds on the trees, or if a blight wipes out your cereal crops? Yes or no? And, that being the case, why should you and your family have to be denied the means to exist which can be found elsewhere, when these are sometimes wrested from you, leaving you short? We want an end to all this. Should you be unable to market as much produce one year as you did the year before, because of the vagaries of nature, we want you to have the same access to what you need, provided, of course, that it can be drawn in from other parts. We know the circumstances in which you too would be prepared to send your produce to other peasant victims of cold snaps, drought or blight. So, in addition to doing away with those who exploit other people’s labours, those who grow rich on it, we want to establish a society in which all men live in fellowship, where no one goes hungry, where everyone is ready to help anyone in need and gets such help whenever required too. This is what the CNT and the FAI stand for. HOW IS THIS TO BE BROUGHT ABOUT? Now let us explain to you how we mean to organize all this. We want to do it without politicians, without bureaucracy, without parliament. The world should belong to the workers. We, you and we, labour in the fields, the factories, the mines. We must look to organizing ourselves, on our own account, in our unions and our communes. Workers’ associations are all that we need. Everything else is a nursery for parasites. Some peasants produce olives and grapes. Others produce rice, or wheat, or oranges. The olive- and grape-growers form one association, the rice-, vegetable-, wheat- and orange-growers another. Along with the other peasants belonging to your federation, you ship your produce to others. They send you theirs. You ship your produce to the cities. The workers in the cities in return send you clothing, footwear, furniture, tools machinery, wireless sets, etc. Is that hard? Certainly not. It merely requires determination to do it and you need only join with us in this work of emancipation and it will be accomplished in very little time. Those who seek to keep you impoverished so that they can live off you argue that we want to strip the rural small-holder of his land. That is a strategem to ensure that you do not join with those who are pointing the way ahead. We want to take the land from him who does not work it. We want to take it from him who has more than he can cultivate. We know that most of the rural small-holders would be a lot better off if society was fairer. WE understand your love of the land which supplies you with the wherewithal for living. For these reasons, we cannot target the small-holder. But we know that work is a lot more productive when the land is worked in common. If ten small-holders were to abolish the boundaries between their fields, they could use modern machinery that would reduce the exertions required of them. On the other hand, the individual small-holder cannot afford such machinery and has to labour mightily to bring in his harvest. And his isolation leaves him defenceless in a bad year. There is work that, unlike wheat and cereal crops, does not require farm machinery; for instance, there is market gardening. Here too, joint production produces outstanding results. On the outskirts of the great cities of Europe there are three or four harvests per year, thanks to this form of farming. But it requires special piping, heating, green-housing and wintering equipment; it requires the use of special chemicals, too dear for the individual pesant to afford. The only ones who can utilize them are those who operate as collectives, or landowners who exploit eight, ten or more workers. 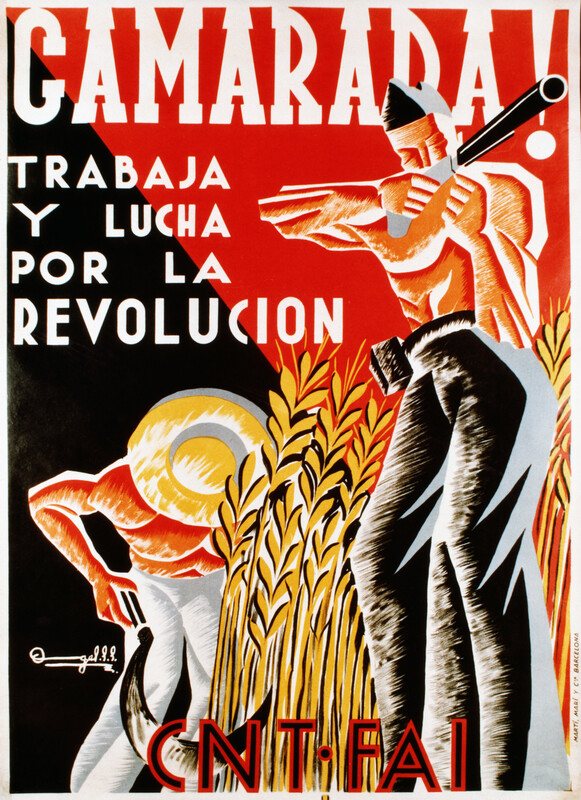 In order to cut back on your exertions, or to ensure that you produce is at least doubled, you must, comrade peasants, work the land in common. Which does not mean that we want to impose this by force. Anybody who says that we do is a liar. We know that, over time, as they see the improvement in results, those who start out as doubters will later be won over. But we would caution you, comrades, against those who want to add to the existing number of small-holdings and who tell you that small-holdings are a necessity. They do this in order to turn you against us, so that division between the rural workers and urban workers protects them from a concerted backlash against those who keep them in wretchedness. We have no desire to forcibly wrest his land from the small-holder, but we say to him: ÒSmall-holding renders farm machinery purchase, or, once bought, payments on it, impossible; it prevents proper improvements to the working of the land. And thereby keeps and will always keep the peasant owner in poverty. Property keeps the peasant at the mercy of the rich man who buys up his land for nothing in times of bad harvests. It makes him the victim of the middle-man who pays him nothing for his produce. Whoever advocates this practices wretched deception against the peasant. You should shun him as a liar, a hypocrite and a traitor. All together, comrade, we shall build a workers’ world. But it will belong to real workers, the sort who use hoe or hammer, file or axe, pick or shovel, who man the plough and the tractor. All together, comrades, we shall do away with poverty, so that our children may be strangers to shortages of food, clothing, care and education. All together, comrades, we shall prevent the return of the landlord, the owner of the land that you work, the collector of pointless taxes, the thieving middle-man. Workers and peasants together, in the CNT and in the FAI, let us set out to free ourselves forever and let us seek the triumph of justice, equality and happiness in a world redeemed and organized on our own account and to meet our needs. If this strikes you as right, comrades, join our ranks. We are waiting for you. 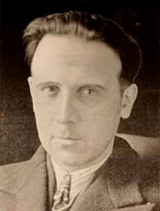 In June 1937, following the May Events in Spain, when anarchists battled Communist and Republican forces in the streets of Barcelona, and many prominent anarchists were arrested, murdered (Camillo Berneri) or simply disappeared, the CNT adopted a “minimal program” to submit to the Republican government and the forces now in control of it, including the Stalinist Communist Party which was itself embarking on a concerted campaign to suppress the anarchist movement and other opposition groups, such as the dissident Marxist group, the POUM (one of whose leaders, Andres Nin, was notoriously “disappeared” and accused by the Communists of being a Francoist fifth columnist). The “minimal program” was not accepted by the government, and the anarchists continued to be marginalized and persecuted by government and Communist-backed forces. Alexander Schapiro wrote the following Open Letter to the CNT criticizing them for their continuing and disastrous policy of collaboration and accommodation with these counter-revolutionary forces. 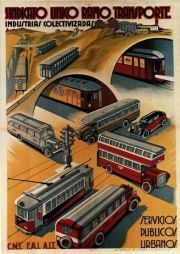 Translated by Joseph Wagner and published in the One Big Union monthly, August 1937. For a similar critique by a Swedish member of the International Workers Association (IWA), see Albert Jensen, “The CNT-FAI, the State and Government” (1938), in Anarchism: A Documentary History of Libertarian Ideas, Volume One, Selection 127. OPEN LETTER TO THE C.N.T. We read with more surprise than interest the minimal program of the C.N.T. “for the realization of a real war policy.” The reading of the program raised an entire series of questions and problems, some of which should be called to your attention. Certainly none of us was simple enough to believe that a war can be carried on with resolutions and by anti-militarist theories. Many of us believed, long before July 19 (1936) that the anti-militarist propaganda, so dear to our Dutch comrades [e.g. Bart de Ligt, Anarchism, Volume 1, Selection 120] of the International Anti-militarist Bureau and which found, in the past, a sympathetic enough echo in the columns of your press in Spain, was in contradiction with the organization of the revolution. Many of us knew that the putsches, that were so dear to our Spanish comrades, such as those of December 8 and January 8, 1933 [CNT-FAI failed insurrections], were far from helping this organization of the revolution; it helped rather to disorganize it. July 19 [1936 – Franco’s coup] opened your eyes. It made you realize the mistake you had committed in the past, when, in a revolutionary period, you neglected seriously organizing the necessary framework for the struggle that you knew would be inevitable on the day of the settlement of accounts. Yet, today you are shutting your eyes to another important fact. You seem to think that a civil war brought about by the circumstance of a fascist putsch does not necessarily obligate you to examine the possibilities of modifying and altering the character of that civil war. A “minimal” program is not something to startle us; but a particular minimal program (such as yours) cannot have any value unless it creates the opportunity for the preparation of a maximal program. But, your “real war policy,” after all, is nothing but a program for entering the Council of Ministers (government); with it you act merely as a political party desirous of participation in an existing government; setting forth your conditions of participation, and these conditions are so bureaucratic in character that they are far from weakening in the least the bourgeois capitalist regime; on the contrary they are tending to strengthen capitalism and stabilize it. The surprising part of your program is that you do not consider it as a means for the attainment of some well defined goal, but consider your “real war policy” program as an aim in itself. That is the main danger in your program. It presupposes permanent participation in the government—not merely circumstantial—which is to extend over a number of years, even if the war itself, with its brutal, daily manifestations would cease in the meanwhile. A monopoly of the Foreign Commerce (have the communists whispered this to you? ), customs policy, new legislation, a new penal code—all of this takes a long time. In order to realize these tasks, your program proposes a very close collaboration on all fields with the bourgeoisie (Republican block) and with the Communists (Marxist block), while almost at the same time you state in your appeal of June 14 that you are sure of triumphing not only against Franco, but also against a stupidly backward bourgeoisie (“the Republican block”) and against the tricky and dishonest politicians (“Marxist block”). You see, therefore, that even your minimal program is beset with flagrant contradictions; its realization is dependent on the aid of the very sectors against which that program is aimed. Even the freedom with which you state these two mutually exclusive programs, collaboration with the bourgeoisie and “Marxism” on the one hand and fight to the finish against this same bourgeoisie and “Marxism” on the other, situates your minimal program as the aim, and your declaration of June 14 becomes mere verbiage. We would have, naturally, liked to see things the other way. The problem of Spain’s economic reconstruction does not form a part of your program. And yet, you cannot help but know that a civil war, like the one you are going through, cannot bring the people to its aid unless the victories on the fronts will assure at the same time their own victories in the rear. It is true—and many of us outside of Spain have known it long before July 19—the Social Revolution cannot be attained in 24 hours, and that a libertarian regime cannot be erected by the turn of the hand. Nevertheless, neither the C.N.T. nor the F.A.I. cared anything about pre-revolutionary organization and about preparing in advance the framework for the social and economic reconstruction. We claim that there is a bridge leading from the downfall of the old regime to the erection of the new regime erected on the ashes and the ruins of the old regime. This bridge is all the more full of dangerous traps and pitfalls as the new regime differs from the old. And it was precisely this period of transition that you have misunderstood in the past and that you continue to misunderstand today. 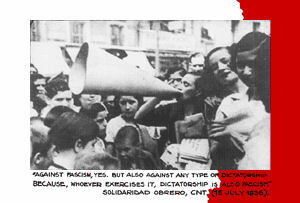 For if you had recognized that the social and economic reconstruction on a libertarian basis is the indispensable condition to victory over fascism, you would have elaborated (having in view the aim to be attained) a minimal revolutionary program that would have given the urban and country proletariat of Spain the necessary will and enthusiasm to continue the war to its logical conclusion. But such a program you failed to proclaim. The few timid allusions contained in your “war program” are far from having a revolutionary character: the elaboration of a plan for the economic reconstruction that would be accepted by the three blocks could only be a naive illusion, if it would not be so dangerous; the municipalization of land is an anti-revolutionary project since it legalizes something that a coming revolution will have to abolish, since the municipalities are, after all, but cogs in the wheel of the State as long as the State will exist. Naturally, the elaboration of an economic program for the transition period presupposes a final aim. Does the C.N.T. consider that libertarian communism is an unattainable “Utopia” that should be relegated to the museum? If you still think (as you did before July 19) that libertarian communism forms part of the program of the C.N.T. it is your duty—it was really your duty since July 1936—to elaborate your economic program of transition, without regard to the bourgeois and Marxist blocks, who can but only sabotage any program of libertarian tendency and inspiration. To be sure, such a program will place you in conflict with these blocks, but on the other hand, it will unite with you the large majority of the workers, who want but one thing, the victory of the Revolution. It is necessary, therefore to choose between these two eventualities. Such a program will, naturally, nullify your “war program” which is nothing but the expression of a “true” desire for permanent cabinet collaboration. But this proposition, this “war program” of yours, is diametrically contrary to the traditionally revolutionary attitude of the C.N.T., which this organization has not denied yet. It is therefore necessary to choose. The C.N.T. should not allow—as it has unfortunately done since July 19—the acceptance of the tactics of the “line of least resistance,” which cannot but lead to a slow but sure liquidation of the libertarian revolution. The ministerial collaboration policy has certainly pushed back to the rear the program of revolutionary economy. You are on the wrong track and you can see that yourselves. Do you not think that you should stop following this road, that leads you to certain downfall? In juridical principle the Collectives were something entirely new. They were not syndicates, nor were they municipalities in any traditional sense; they did not even very closely resemble the municipalities of the Middle Ages. Of the two, however, they were closer to the communal than the syndicalist spirit. Often they might just as well have been called Communities, as for example the one in Binefar was. The Collective was an entity; within it, occupational and professional groups, public services, trade, and municipal functions were subordinate and dependent. In form of organization, in internal functioning, and in their specialized activities, however, they were autonomous. The agrarian Collectives, despite their name, were to all intents and purposes libertarian communist organizations. They applied the rule “from each according to his abilities, to each according to his needs.” Where money was abolished, a certain quantity of goods was assured to each person; where money was retained, each family received a wage determined by the number of members. Though the technique varied, the moral principle and the practical results were the same. In the agrarian Collectives solidarity was carried to extreme lengths. Not only was every person assured of the necessities, but the district federations increasingly adopted the principle of mutual aid on an inter-collective scale. For this purpose they created common reserves to help out villages less favoured by nature. In Castille special institutions for this purpose were created. In industry this practice seems to have begun in Hospitalet, on the Catalan railroads, and was applied later in Alcoy. Had the political compromise not impeded open socialization, the practice of mutual aid would have been much more generalized. A conquest of enormous importance was the right of women to livelihood, regardless of occupation or function. In about half of the agrarian Collectives, women received the same wages as men; in the rest women received less, apparently on the principle that they rarely lived alone. The child’s right to livelihood was also ungrudgingly recognized: not as State charity, but as a right no one dreamed of denying. The schools were open to children to the age of 14 or 15—the only guarantee that parents would not send their children to work sooner, and that education would be really universal. In all the agrarian Collectives of Aragon, Catalonia, Levante, Castille, Andalusia and Estremadura, the workers formed groups to divide the labour or the land; usually they were assigned to definite areas. Delegates elected by the work-groups met with the Collective’s delegate for agriculture to plan out the work. This typical organization arose quite spontaneously, by local initiative. In addition to these meetings—and similar meetings of specialized groups—the Collective as a whole met in a weekly or bi-weekly or monthly Assembly. This too was a spontaneous innovation. The Assembly reviewed the activities of the councillors it named, and discussed special cases and unforeseen problems. All inhabitants—men and women, producers and non-producers—took part in the discussion and decisions. In many cases the “individualists” (non-collective members) had equal rights in the Assembly. In land cultivation the most significant advances were: the rapidly increasing use of machinery and irrigation; greater diversification; and forestation. In stock-raising: the selection and multiplication of breeds; the adaptation of breeds to local conditions; and large-scale construction of collective stock-barns. Production and trade were brought into increasing harmony and distribution became more and more unified: first district unification, then regional unification, and finally the creation of a National Federation. The district (comarca) was the basis of trade. In exceptional cases an isolated Commune managed its own, on authority of the district Federation which kept an eye on the Commune and could intervene if its trading practices were harmful to the general economy. In Aragon the Federation of Collectives, founded in January, 1937, began to coordinate trade among the communes in the region, and to create a system of mutual aid. The tendency to unity became more distinct with adoption of a single “producer’s card” and single “consumer’s card”—which implied suppression of all money, local and national—by decision of the February, 1937, Congress. Coordination of trade with other regions, and abroad, improved steadily. When disparities in exchange, or exceptionally high prices, created surpluses, they were used by the Regional Federation to help the poorer Collectives. Solidarity thus extended beyond the district. Industrial concentration—the elimination of small workshops and uneconomical factories—was a characteristic feature of collectivization both in the rural Communes and in the cities. Labour was rationalized on the basis of social need—in Alcoy’s industries and in those of Hospitalet, in Barcelona’s municipal transport and in the Aragon Collectives. The first step toward socialization was frequently the dividing up of large estates (as in the Segorbe and Granollers districts and a number of Aragon villages). In certain other cases the first step was to force the municipalities to grant immediate reforms (municipalization of land-rent and of medicine in Elda, Benicarlo, Castillone, Alcaniz, Caspe, etc.). Education advanced at an unprecedented pace. Most of the partly or wholly socialized Collectives and municipalities built at least one school. By 1938, for example, every Collective in the Levante Federation had its own school. The number of Collectives increased steadily. The movement originated and progressed swiftly in Aragon, conquered part of Catalonia, then moved on to Levante and later Castilie. According to reliable testimony the accomplishments in Castille may indeed have surpassed Levante and Aragon. Estremadura and the part of Andalusia not conquered immediately by the fascists— especially the province of Jaen—also had their Collectives. The character of the Collectives varied, of course, with local conditions. We lack exact figures on the total number of Collectives in Spain. Based on the incomplete statistics of the Congress in Aragon in February, 1937, and on data gathered during my stay in this region, there were at least 400. In Levante in 1938 there were 500. To this the Collectives in other regions must be added. In my research I found only two Collectives which failed: Boltona and Ainsa, in Northern Aragon. Sometimes the Collective was supplemented by other forms of socialization. After I left Carcagente, trade was socialized. In Alcoy consumers cooperatives arose to round out the syndicalist organization of production. There were other instances of the same kind. The Collectives were not created single-handed by the libertarian movement. Although their juridical principles were strictly anarchist, a great many Collectives were created spontaneously by people remote from our movement (“libertarians” without being aware of it). Most of the Castille and Estremadura Collectives were organized by Catholic and Socialist peasants; in some cases of course they may have been inspired by the propaganda of isolated anarchist militants. Although their organization opposed the movement officially, many members of the Socialist UGT (Union General de los Trabajadores) entered or organized Collectives, as did Republicans who sincerely wanted to achieve liberty and justice. Small land-owners were respected. Their inclusion in the consumer’s card system and in the Collective trading, the resolutions taken in respect to them, all attest to this. There were just two restrictions: they could not have more land than they could cultivate, and they could not carry on private trade. Membership in the Collective was voluntary: the “individualists” joined only if and when they were persuaded of the advantages of working in common. a) The existence of conservative strata, and parties and organizations representing them: Republicans of all factions, Socialists of Left and Right (Large Caballero and Prieto), Stalinist Communists, and often the POUMists. (Before their expulsion from the Catalonian government—Generalidad—the POUMists were not truly a revolutionary party. They became so when driven into opposition. Even in June, 1937, a manifesto distributed by the Aragon section of the POUM attacked the Collectives.) The UGT was the principal instrument of the various politicians. b) The opposition of certain small landowners (Catalan and Pyrenees peasants). c) The fear, even among some members of Collectives, that the government would destroy the organizations once the war was over. Many who were not really reactionary, and many small landowners who would otherwise have joined the Collectives, held back on this account. 19. In the work of creation, transformation and socialization, the peasant demonstrated a social conscience much superior to that of the city worker.